Metta World Peace, the Los Angeles Lakers' star formerly known as Ron Artest, was ejected from a game last night against the Oklahoma City Thunder for what referees determined was a flagrant foul. After a fast break and dunk that brought the Lakers one point ahead of the Thunder in a close match, World Peace (as he is known) pounded his chest and then, with considerable force, elbowed James Harden of the Thunder. The NBA is reviewing his further punishment, though media speculation suggests that it will be a five-game suspension. 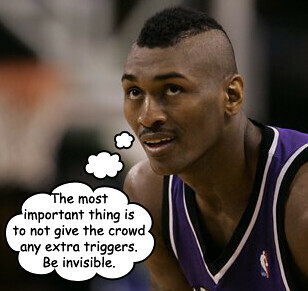 By all accounts (except maybe the woman he allegedly assaulted), Ron Artest isn't what you would classify as a bad person. He's criminally misunderstood, sure, but he isn't someone who laces up his shoes with the intent to do harm. What he has proven, however, is that when he gets too amped up on adrenaline, he becomes a danger to the people in his physical proximity. Unfortunately for Ron, his job happens to require that he amp himself up on adrenaline, and fling his body into other people. Thus—all accusations about his morality aside—as long as he's allowed to play in the NBA, he will always be a danger to those around him. In 2004, World Peace was suspended for an entire season after attacking a fan and inciting a brawl during a dispute with an opposing teammate. Since that time and until last night, he'd been on his best (on court) behavior. In fact, following the Lakers' world championship in 2010, World Peace took the unusual step of thanking his psychiatrist, calling her "crucial." It wasn't the first time he spoke out about his own mental health issues -- or even lent support for the cause. Though he hasn't revealed a specific diagnosis, he has testified before Congress about mental health awareness and talks about the subject at schools. "We have a big problem right here in America with mental health, from little boys not understanding what it takes to be a good dad or be a good older brother or a role model -- to violence," he has said. It's no surprise that many athletes, just like anyone else, might have mental health issues. But it's refreshing to hear them talk about it -- and another step toward reducing the stigma of getting help. Here are a few others who have opened up about their psychological struggles.